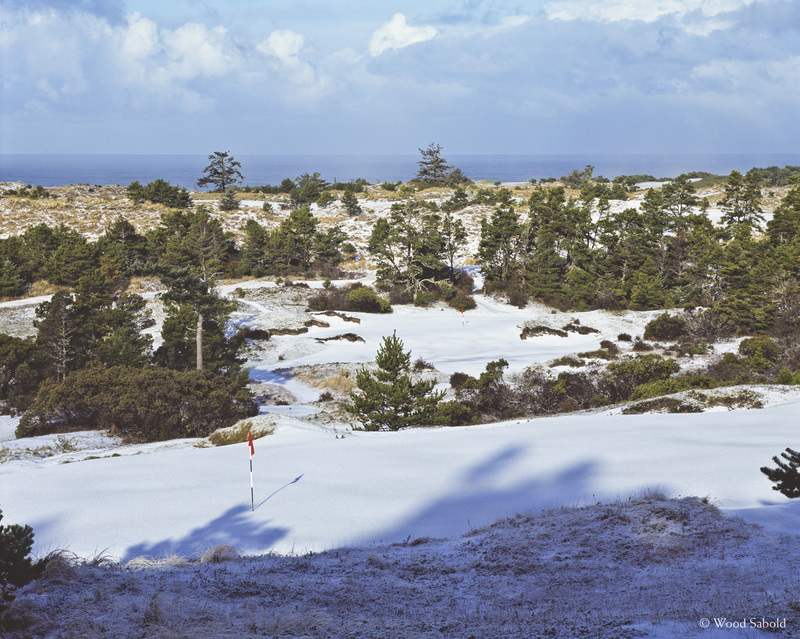 This view shows a rare snow scene of the blind green of the uphill par 5, 16th hole of the Bandon Trails Course of the Bandon Dunes Golf Resort, Bandon, Oregon. Snow only occurs maybe once in 7-10 years. When it does happen, it turns the course into a winter wonderland. One of the favorite one shot holes, the par 3, 17th hole can be seen in the distance as well as the blue ocean horizon beyond. Bandon Trails is the third course of the acclaimed Bandon Dunes Golf Resort. The course opened in 2005. Architect, Bill Coore and Ben Crenshaw.